Founded just over a year ago, Bay Leaf Kitchen teaches kids about farm-to-table cooking through fun, hands-on activities. This year, CUESA co-sponsored two week-long sessions of Bay Leaf Kitchen’s summer camp, where kids learn about, purchase, cook, and eat farm-fresh produce from the Ferry Plaza Farmers Market, and then trace their food to its roots by visiting a working organic farm. 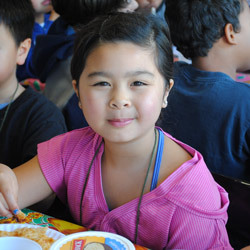 Tse is one of 15 recipients of a new CUESA scholarship that takes the Foodwise Kids program to the next level. 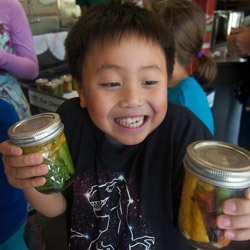 The scholarships pay for students who have participated in Foodwise Kids, CUESA’s culinary farmers market field trip for public elementary school classes, to attend Bay Leaf Kitchen summer camp. Funded by generous donors at CUESA’s annual fall gala, the scholarships give priority to families with the greatest financial need. During her time as Market Chef at CUESA, Friedman started the Foodwise Kids program to nurture children’s love for fruits and vegetables at the farmers market. Last year she set off on her own to found Bay Leaf Kitchen with past Foodwise Kids volunteer Amy Nghe in order to provide a deeper dive for students. 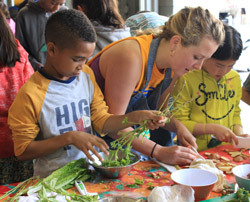 At Bay Leaf Kitchen camp, kids spend a week immersed in healthy cooking and eating, with the first three days spent learning cooking fundamentals in the CUESA Kitchen. Campers are given market tokens to shop for fresh ingredients at the Ferry Plaza Farmers Market to use in their cooking classes. They’re granted freedom of choice, resulting in creative dishes like made-from-scratch pizza topped with avocado, blueberries, and honey. Kids also learn about local produce through a guessing game in which they try to distinguish locally grown produce from imported, and they interview farmers to learn more about where their food comes from and to collect fun, food-related facts, later voting on their favorites. After three days in the kitchen, campers pack their bags and hit the road to get the bigger picture of a sustainable food system. Campers venture out of the temperate Bay Area climate and into the heat at Eatwell Farm in Dixon, California, to explore the farm with co-owner Lorraine Walker. Walker gave the okay, and the kids raced through the trees, filling their bags with fruit. After this week-long immersion, Bay Leaf Kitchen campers bring their newfound cooking confidence and excitement about healthy food into their homes. Parent David Brown noticed the impact immediately when his son Harrison, 9, attended camp on a CUESA scholarship earlier this month. This, to Friedman, is what Bay Leaf Kitchen is all about. 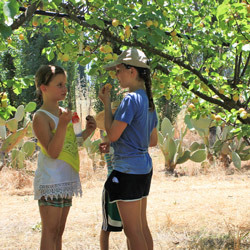 CUESA’s Foodwise Kids scholarships have already been granted for the year, but Bay Leaf Kitchen is offering two more weeks of camp at other locations in July. Learn more and enroll. All photos by Ana Valdes, except for the bottom photo by Bay Leaf Kitchen.